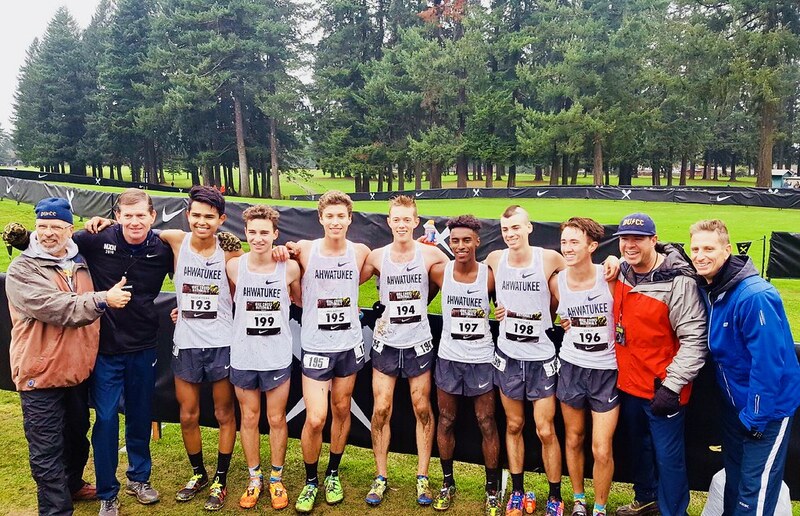 DVCC coaches and runners celebrate an 8th-place finish at the Nike Cross Nationals (NXN) in Portland, OR. Sometime in late November of 2016, in an empty, quiet corner of a Desert Vista hallway, a choice was made. Still stinging from the bitter disappointment of a poor NXR performance, Coach Hanson and a small group of returning varsity runners solemnly gathered and set an ambitious goal; we would make history and become the first Arizona boys team to ever qualify for Nike Cross Nationals. No matter the effort required, no matter the sacrifices we must make, no matter the odds, we said, we will qualify for Nationals. The following hour was spent discussing the details of what we would change in our training plan to achieve this goal, but the course had been set. Come NXR next year, we were going to toe the line knowing we had done everything in our power to succeed. We were already extremely fit; our State championship win over Brophy had proven that. The critical boost in performance that we were looking for wasn’t to be found in some dramatically altered training plan, but in the constant, diligent attention to small details. Over the next year of training, we focused on things like improving our nutrition, getting enough hours of sleep (difficult to do with 5 am practices), and consistently doing body strengthening movements like the GS Core series and Lunge Plank Matrix. However, it's important to note here that a successful cross country team is never just seven fast guys. It’s an entire team of dedicated individuals working together, pushing each other, towards improvement. It’s unfortunate that even though the whole team works and strives together, only seven boys have the honor of racing the championship meets at the end of the season. Every single boy on the team contributes and improves the team with their efforts. When I opened my phone and saw the words “At Large Bid #4: Desert Vista” I couldn’t believe my eyes. If ever there was a time for one to scream out loud and madly run around the house with wild abandon, it was this moment. We made it!! Some of us met at Coach Hanson’s house that night to celebrate (involving a lot of yelling and jumping) and to fill out the needed paperwork. The entire week leading up to the at-large bids announcement, we had each been overwhelmed by feelings of anxiety, regret, and frustration. The satisfaction of those emotions swinging to pure joy and elation in a single moment was one of the greatest experiences I’ve ever felt. We knew we deserved to be at Nationals and were so honored to have had the committee choose our team. Next came the fun part. Nike pays for every aspect of the trip, from flights to food to transportation. On top of that, they give each athlete a generous package of free gear: shoes, spikes, sweatpants, shirt, jersey, and more. The other boys and I had heard and seen pictures of this enviable trove of treasure, but seeing it in person was even more incredible. However, the crowning jewel and main attraction of Nike Cross Nationals is the race. We enjoyed the gifts and luxury Nike provides, but had to focus ourselves on the central reason we were there: to crush the competition. Going into the race, we discussed a slightly different game plan than usual. We usually try to race with as even splits as possible, which often means being behind at the first mile. However, coming from behind is much harder to do on the Glendoveer course, with its soaked, muddy fields and tough hills, so we decided to go out hard down the first stretch to establish a strong early position. The day of the race arrived on a cool, wet, Oregon morning. As we boarded the bus and prepared to head to the course, there was a hint of nervousness among us, but also a wealth of determination and confidence. We knew that some people didn’t think we deserved to be at Nationals -- we were going to prove them wrong. With confidence in our plan and in our training, we took to the starting line around 10 am. At the crack of the starting pistol, we surged forward and proceeded to lay down a performance that validated all our work and silenced the critics. Our pack of runners was led off by senior Reece Donihi with a crucial and impressive performance. Reece ran 16:00.5 on the demanding course and placed 57th. He was followed by sophomore Sammy Van Alstine with a time of 16:07.7 in 68th place. Senior Habs Cheney followed with a time of 16:12.7 in 75th pace. Next across the line was senior Bryce Schmisseur in 92nd place with a time of 16:23.1. The scoring top five was rounded off with Aksel Laudon in 125th place with a time of 16:37.1. Following close behind were senior Nick Thatcher in 128th place at 16:39.0 and junior Lee Nasewytewa in 134th place with a time of 16:40.8. As we gathered together past the finish line, a buzz of excitement grew. We had done well and we knew it. Coach Hanson slowly told us the scores as he got them and when we found out that we’d gotten 8th as a team we burst with pride. This was the culmination of months and years of sacrifice and work, and to see it pay off was incredible. Although the road was a little bumpy, we accomplished our goal and more. Not content to merely show up at nationals, we came prepared to race and gave it everything we had. We proved that the Desert Vista Thunder are a force to be reckoned with. As always, I’d like to thank the coaches, boosters, and parents who make all of this possible. I probably don’t appreciate enough how much time you guys put into us. As a senior, this was the last High School cross country race of my life, which is pretty saddening, but because of the selfless work of you volunteers, all my teammates and I will be able to look back fondly on our time as DVCC athletes. I’d also like to thank all my fellow teammates. Thank you for all the memories and laughs, and for making these last four years with you guys amazing. I can’t wait to see what you all accomplish in the future.